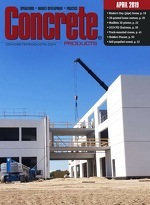 If not from day one, the U.S. Green Building Council has come around on construction criteria where concrete excels: Life cycle assessment (LCA), starting with LEED v4 green building rating system provisions, and now as one of the principles guiding an advocacy effort friendly to pervious or permeable interlocking concrete pavements. Cities can leverage smart pavement and building surfaces to reduce the amount of hot air being reflected back into the surrounding environment, thereby lowering peak month temperatures and spurring a chain of related cost savings. Smart surface technologies equip users to better manage sun radiation and rain events through a) porous road or street pavements and flatwork that reduce runoff, and flooding while cutting drainage and conveyance infrastructure costs; b) cool roofs and pavements that reflect away sunlight versus absorbing it, thus reducing temperatures and smog levels; plus, c) green roofs and trees that provide shade and reduce flood risk. The Coalition’s new “Stay Cool | Save Cash” report applies LCA to estimate returns on investment over a 40-year period. With Philadelphia as a case in point, it shows the city incurring $2.38 billion in smart surface first costs plus operations and maintenance, yet realizing $5.96 billion in benefits over four decades. That equates to nearly $3.6 billion net present value. Summer heat waves are the new norm in the U.S., the Coalition contends. Some scientists find that most American cities, against present weather readings, will experience up to five or 10 times as many excessively hot (> 90°F) days within a few decades. Consumers and companies incur higher energy and health care costs due to rising temperatures, Stay Cool | Save Cash authors observe, rendering communities less livable and healthy. Smart surface technologies yield cost of living savings, they add, plus reduced water treatment and infrastructure expenditures. The Coalition is working with a dozen cities to develop tools and training to support mayors, managers and other stakeholders across the country to understand and embrace new opportunities. Over the next five years, it hopes to partner with 250-plus cities to begin implementing smart surfaces as policy. As with other market development work in the green-building era, the National Ready Mixed Concrete Association and Interlocking Concrete Pavement Institute, along with allied material, product or contractor groups, were ahead of the curve in helping standardize and promote pervious or permeable vehicular and pedestrian pavements. Both methods stand to gain renewed prominence through Smart Surfaces advocacy. Coalition members will have a wealth of NRMCA and ICPI design, construction, maintenance and performance data to exploit concrete’s capacity to cool urban environments; confine runoff to areas benefitting trees, plants and the community; and, above all, save dollars needed elsewhere in municipal budgets.